Women’s financial positions are improving slowly but there are still major hurdles when it comes to pay, penalties for becoming a mother and a growing retirement savings gap. There remains a 9.2 per cent gap between the median pay of men and women but it has fallen from 16.3 per cent in 1998. Gail Pacheco, a professor in economics at AUT who carried out research on behalf of the Ministry for Women on the reasons behind the gender pay gap in 2016, said it was good to see the pay gap closing. But Sue O’Shea, a spokeswoman for the Wellington Pay Equity Coalition, said progress was painfully slow. She also pointed to concerns over Māori and Pacific women who are worse off than Pākehā women. Household economic data analysed by the Coalition for Equal Value, Equal Pay, shows in the year to June 2018 Pākehā women had an average hourly rate of $28.38 compared to Pacific women’s $23.01 and Māori women’s average pay of $24.26. 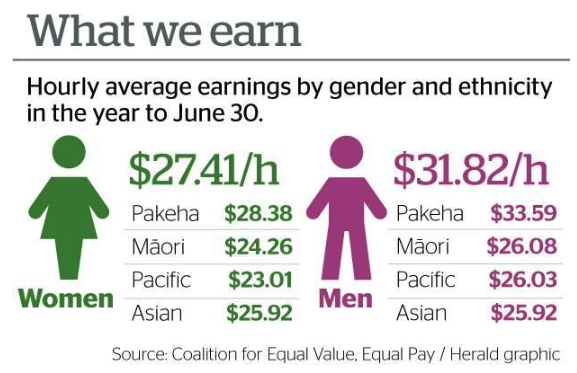 The gap between what the average Pacific woman earns and the average Pākehā man is more than $10 an hour, with Pākehā men on average earning $33.59 an hour. O’Shea believes combining ethnicity and being a woman is resulting in compounding effects of discrimination. She says that is why there needs to be a hard look at female dominated occupations to make sure the work they are doing is properly valued. Pay equity settlements like those in the care workers industry last year will take a big bite out of the gap, she says. Pacheco’s research found that 80 per cent of the pay gap was “unexplained” and put this down to bias – both conscious and unconscious and different preferences for non-wage components of the job such as flexibility. O’Shea says the answer to that should be to normalise flexibility across the workforce so that it is not women being financially penalised for choosing it. From day one of their careers women face a gap in their pay with men. per cent and 25 to 29 it was 4.2 per cent. But after age 30 it begins to grow, reaching a peak between 50 to 54 of 18.4 per cent. Pacheco’s research on the effects of becoming a parent found on average after women have children they’re less likely to be employed, and if they do work they work fewer hours and have lower monthly wage earnings. The average woman earns 4.4 per cent lower hourly wages as a parent than if she hadn’t had children while men see no significant impact. The amount of time out of the workforce also has an influence with an insignificant change if women return to paid work within six months; and widening to an 8.3 per cent drop if they take longer than a year to return. Lower wages, time out of the workforce to have children and part-time work also has a major impact on how much women are able to save for their retirement. Figures from ANZ Bank, the country’s largest KiwiSaver provider, show as of January 31 there was a 20 per cent gap in the average balances between men and women – up from 19 per cent a year earlier. “We estimate that a 25-year-old woman, on average, is likely to retire with $145,000, compared to $223,000 for a 25-year-old man,” a spokeswoman for the bank said. Retirement Commissioner Diane Maxwell says it is already well known that women reach retirement with less and then live for longer which means they are more likely to live in hardship. But she believes part of the problem rests in women’s attitude towards money with women far more likely to say money doesn’t matter to them. She says many women she talks to are proud that they don’t chase the dollar. “But by doing that it reduces their ability to buy a house, drive a car that is safe, to have a savings buffer. She says women need to get over their squeamishness about talking money and also break attitudes of believing that it is up to men to provide or sort out finances like insurance or having a will. She says the flip side of the coin is the pressure on men – on their health and well-being to provide – to have to bring home the bacon. But she also acknowledges that women have come a long way. It was only in her mother’s generation that women were unable to work once they had children and could not get a bank loan. Yet when she was a single mother she was able to earn enough to support herself and her daughter and get a loan.